The Philips Hue White Starter Kit lets you create a customised lighting environment in your home from virtually anywhere. Control your Hue white system wirelessly from your iPhone, iPad or iPod touch. Simply download the Philips Hue app to start creating unique light settings that match your activity or mood. This starter kit contains two Hue light bulbs and the Hue bridge. Works perfectly. I spent almost 30 minutes to set it up, mostly playing with Phillips Hue app settings, like Siri support and enabling different scenes. Eas Works perfectly. 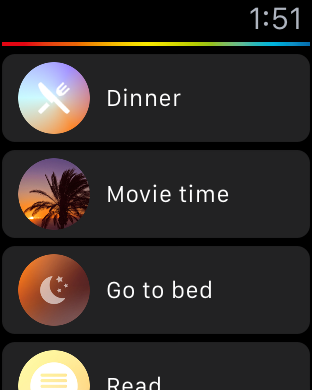 I spent almost 30 minutes to set it up, mostly playing with Phillips Hue app settings, like Siri support and enabling different scenes. Easy to get to sleep and easy to wake up, so I don't used my alarm clock anymore. Set up was straight forward with the Philips HUE app and the Apple HOME app. I can now control the lights from either app. I have several Apple devices and am a Set up was straight forward with the Philips HUE app and the Apple HOME app. I can now control the lights from either app. I have several Apple devices and am able to have all the devices control the lights through either the HUE or HOME apps. FYI: The lights that come in the kit are each 9 watts, 840 lumens, 2700K (warm). This is equivalent to about a 60 watt "standard", filament bulb. I began experimenting with smart home devices after purchasing the Echo Dot from Amazon on Prime Day. I have devices from Philips, TP-Link and iHome. The bas I began experimenting with smart home devices after purchasing the Echo Dot from Amazon on Prime Day. I have devices from Philips, TP-Link and iHome. The basic Philips starter kit comes with a hub, an Ethernet cable and two small light bulbs. The introductory bulbs are dimmable, but do not have features such as variations of light tones or color. The Philips bulbs work with either HomeKit or Echo,. You must use the bridge. (Having the same bulbs in both platforms can be confusing.) The Home app in iOS should recognize Philips smart bulbs and ask for a code from the device or its packaging as soon as you are connected to your home network. You scan the code with the camera on your phone or tablet. Setup takes place within the app. 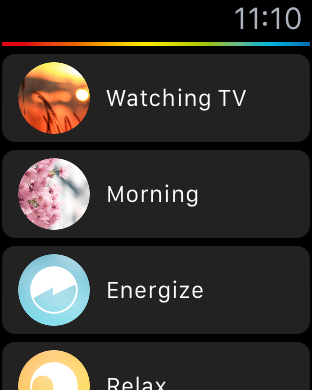 There is also a Hue app for discovery and adjustments. The bulbs have worked successfully with my iPhone 6S and iPad, latest generation. So far, the bulbs have not worked with Apple TV, fourth generation. Siri does not recognize them on my MacBook Air, either. What about the alternatives? TP-Link light bulbs and smart plugs are independent of a hub. The Wi-Fi technology is built into the bulb or smart plug. This makes the bulbs bigger and heavier. TP-Link gear works with Echo, but not with HomeKit. The iHome smart plug works with both HomeKit and Echo. It is a wall plug you connect the device to. A smart bulb, for example, is not required for on/off instructions. I am just now getting into the smart home technology. These lights were my first to purchase. These products are great and responsive! I love that the light dim I am just now getting into the smart home technology. These lights were my first to purchase. These products are great and responsive! I love that the light dims on and off instead of instant on and off. The only reason I did not give these a 4 star is for the color of the that emits. It is way warmer than I prefer. I could have done a little research and realized how warm the light was before purchase and probably would have changed my mind. I could also spend more money and buy ones that I can adjust the color, but they are very expensive. If these were just a little cooler, they would receive a 5-star rating. Other than that, it was a fairly easy setup process. Getting it connected to Apple Homekit was a little challenging. My Homekit app told me that there were no accessories but the Philips Hue app told me that it was connected to Homekit already. That was an easy fix though. Overall, I am satisfied. Is this review useful?Great Product! Hue app works great, lights are awesome, but compatibility with homekit is awful. Half of the time lights are not responding when operated from Home app. IKEA h Hue app works great, lights are awesome, but compatibility with homekit is awful. Half of the time lights are not responding when operated from Home app. IKEA has done it a lot better and has no such issues at lot lower price. Would recommend. Setup is super easy. Also compatible with "IFTTT" allowing you to turn on lights when ISS is above house. So cool! The Hue Bridge is a Zigbee gateway, but interfaces to your existing home network solely through the The Hue Bridge is a Zigbee gateway, but interfaces to your existing home network solely through the Ethernet port. The Hue bridge does not have any WiFi capabilities. It is compatible with any hue bulb up to 50. I have mine connected with Hue Bloom, Hue lightstrip, H It is compatible with any hue bulb up to 50. I have mine connected with Hue Bloom, Hue lightstrip, Hue White, Hue Colour, and Hue downlight in multiple rooms with one Hub. In terms of music, the Hue app does not support this at the moment. However, you can download a third-party app that can sync to your Hue Hub and make the Hue's in your room change colours. I have used a third-party app to have my Hues change colours while watching a movie.